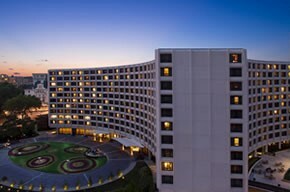 The Washington Hilton is providing the special rate of $201 per night (excluding applicable sales tax of 14.8%) for attendees of the 2017 ONC Annual Meeting. If you prefer to make your reservation by phone, please contact the Washington Hilton directly at (202) 483-3000 and provide them with the group code ONC. If you do not reference the group code, the hotel may not provide you with the group rate. The hotel is holding a block of rooms for the meeting until 5 p.m. (EDT), Monday, November 6, 2017 based on availability. After this date, room availability and the special conference/per diem rate will not be offered. Please note that you should make your reservations as early as possible since rooms may go quickly and earlier than the hotel cut-off date. Check-in is at 4 p.m., and checkout is at 11 a.m. A $50 fee will be applied to all late checkouts. If you need to cancel, you must do so no later than 72 hours prior to the night of your arrival to avoid paying a penalty. All areas of the hotel are nonsmoking. Valet parking is available at $48 per day; self-parking is available at $40 per day. Metrorail is an option, including those flying in and out of Reagan National (DCA). The Dupont Circle Metro Station on the Red Line is the closest Metro Station to the hotel. The hotel is located approximately 4 blocks from the Dupont Circle Metro Station on the Red Line. Exit at the north end of the Station to Q Street and walk 4 blocks north on Connecticut Avenue to the Washington Hilton. Complete Metrorail information is available at www.wmata.com. Taxi fares to the Washington Hilton are approximately $25 from DCA, $60 from IAD, and $80 from BWI. Super Shuttle fares to the hotel are approximately $14 from DCA, $30 from IAD, and $38 from BWI. For reservations and information, go to http://www.supershuttle.com or call 800-BLUE-VAN (800-258-3826). From Ronald Reagan Washington National Airport (DCA). Follow signs to I-395 and the 14th Street Bridge. While on 395 North, move to the left lane when you see the sign for Route One. This will take you to the 14th Street exit. Take 395 North over the 14th St. Bridge. Stay in the left-hand lane, and take 14th Street to R Street NW. You will notice the streets run alphabetically. Make a left on R Street. Follow R Street for 6 blocks to Connecticut Avenue NW. Make a right on Connecticut Avenue. The Washington Hilton will be 4 blocks up on the right. From Washington Dulles International Airport (IAD). Take the Dulles Toll Road to I-66 East. Take I-66 to the Constitution Avenue exit and follow Constitution Avenue to 18th Street. Turn left on 18th Street to Connecticut Avenue. Turn left on Connecticut Avenue. Stay in the left-hand lane and take the Dupont Circle underpass. The Washington Hilton will be 3 blocks up on the right corner at Connecticut Avenue and T Street. From Baltimore/Washington International Thurgood Marshall Airport (BWI). Leave terminal and follow signs to I-95 South. Take I-95 South to 495 West, and take exit 33. The sign will say Chevy Chase/Connecticut Avenue. Take Connecticut Avenue south. After approximately 5 miles on Connecticut Avenue south, you will see the National Zoo on your left. Five blocks after the zoo you will come to the William Taft Bridge. Cross the bridge and get into the left lane. At the third traffic light, make a left. The hotel will be on your left. From Baltimore/Eastern Pennsylvania/New York – North. Take I-95 South to 495 West. Take 495 West to exit 33, The sign will say Chevy Chase/Connecticut Avenue. Take Connecticut Avenue south. After approximately 5 miles on Connecticut Avenue south you will see the National Zoo on your left. Five blocks after the zoo you will come to the William Taft Bridge. Cross the bridge and get into the left lane. At the third traffic light, make a left. The hotel will be on your left. Take I-95 North to 395 North. Stay on 395 North, and when you see the sign for Route One move to the left lane. This will take you to the 14th Street exit. Follow 395 North over the 14th Street Bridge. Stay in the left-hand lane. Take 14th Street to R Street NW. You will notice the streets run alphabetically. Make a left on R Street. Follow R Street for 6 blocks to Connecticut Avenue, NW. Make a right on Connecticut Avenue. The Washington Hilton will be three blocks up on right. Take I-66 to Constitution Avenue to 18th Street. Turn left on 18th Street to Connecticut Avenue. Turn left on Connecticut Avenue. Stay in the left-hand lane and take the Dupont Circle underpass. The Washington Hilton will be on the right.